SDL Trados GroupShare Blogs What are recognized tokens aka placeables in SDL Trados Studio? Today, I want to share some info (that can also be found in the SDL Trados Studio Online Help) about recognized tokes also known as placeables. When I started to use SDL Trados 2007 I was somehow like "Placeables...Tokens...What???". However, within these ...so far 8 years... it&#xA0;took some time for me at the beginning to understand but&#xA0;I managed to get a grip of the tokens :) and the Online Help as it is today, explains everything really well. Therefore I gathered the information from the Online Help regarding "recognize tokens" in this blog post and hope the veterans and also newbies and everyone in-between can find still useful information. Content which can be automatically localized by applying a translation memory. For example, some dates can automatically be converted to the correct format by applying a translation memory. Markup tags, placeholder tags, numbers, variables, dates, acronyms and alphanumeric strings are all examples of recognized tokens.&#xA0;They are identified in the Editor window by a blue square-bracket underline. Note: The underline is only displayed when you have a translation memory open and the cursor is in the segment where the recognized token is located. 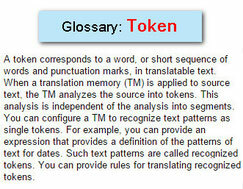 The TM settings determine which tokens are recognized. The TM scans the TU for recognized tokens only when the TU is added to the TM. If you later enable token recognition, the TM does not immediately analyze existing TUs for tokens: you need to re-index the TM. When you do so, the TM uses the current token settings and scans existing TUs for tokens. If you select this option, dates in source segments are automatically converted to the correct format to be placed in target segments. If the source segment in a translation memory matches segment in the presented text in all content apart from the value of the date that occurs in the segment, the TM still registers a 100% match. The TM returns the translation and uses the value of the date from the presented text (rather than from the TM) to complete the translation. This is also the case for matching segments that contain numbers, variables, alphanumeric strings, times, measurements and acronyms. In addition, the value of the date from the presented text will replace the value of the date in the target segment of the TM if the same date is used in both the target and source segment of the TM. If you have defined some auto-localization settings for dates, these will be applied to dates in target segments. You define auto-localization settings for a language pair in the Options dialog box under Language Pairs. Select this to recognize a time of day occurring in a source segment and convert the time to the correct format in target segments. Times can also be automatically converted to the correct target language format. Select this to recognize a number occurring in a source segment and convert it to the correct format in target segments. For example, suppose the following segment occurs in your English-German translation: Today, the DAX was down 11.98 points (= 0.55%) to 4,312.79. The numbers would appear in the German translation as: 11,98, 0,55%, and 4.312,79. Instead of trying to translate such strings, Studio automatically transfers the alphanumeric string from the source segment into the target segment. Then it completes the segment translation by inserting the rest of the text from the translation unit. The option to Recognize alphanumeric strings is only compatible with GroupShare 2014 SP2 and later. This means that TMs available on previous GroupShare servers cannot recognize alphanumerics.&#xA0;For file-based translation memories, this option is always available, regardless of the Studio version in which the file-based TM was created. If you choose to recognize acronyms, they become available interactively in the recognized tokens drop-down list in the Editor view. Acronyms are treated literally (like words) but are still recognized text; this enables you to select them from the recognized tokens drop-down list and insert the acronym quickly into the target segment. a word in uppercase containing minimum one letter, followed by & and followed by at least another uppercase letter. Items containing a full stop are not recognized as an acronym. If acronym recognition is activated, URLs (hyperlinks) and IP addresses are also recognized as recognized tokens. &#xA0; Note: If more than 66 % of the letters in a segment are in uppercase and the segment contains at least two words, Studio considers that there are no acronyms in the text and treats the words literally. For example, Studio will detect two acronyms in "ABCD abcd ABCE&#x201D;, as 66% of the letters are in uppercase, and none in &#x201C;ABCD abcd ABCEF&#x201D;, as 75% of letters are in uppercase. Select this to recognize variables. Variables are items which should not be translated. You create a list of variables in the Language Resources. This list appears in the New Translation Memory wizard, the New Server-based Translation Memory wizard, and also in language resource templates. Variables are recognized tokens, and are copied verbatim into the target segment. If you choose to recognize numbers (that includes numbers which are part of a measurement) SDL Trados Studio will place the number in the target segment and format it correctly for the target language. Word Count Settings: you can control how the word count engine reports words that are separated by hyphens, dashes or formatting tags. These settings are disabled when creating a new server-based translation memory. Select this to make words that contain hyphens count as a single word. For example, with this enabled, "two-wheeled vehicles" counts as two words, with this disabled, it counts as three words. By default, this is enabled. Select this to make words that are separated by dashes count as a single word. For example, with this enabled, "two&#x2014;wheeled vehicles" counts as two words, with this disabled, it counts as three words. By default, this is enabled. Select this and the word count engine will not break words that contain formatting tags. The project settings determine if the software does or does not auto-localize these tokens.